Review albums arrive from a variety of places and this was even odder than usual, as it came from a photographer friend in London who saw Suzette performing in Texas and felt I would like and review it. He was 100% correct. As regular readers will know I’m a stickler for good artwork and a powerful opener and Suzette delivers both with bells on. If I’d spotted the CD in a rack I’d definitely have picked it up and opening track ‘Baby Don’t Cry’ is a classic heartbreaking Country song sung from the pits of her stomach; with a pedal-steel and mandolin competing for your tear ducts. The title track follows and boy does it do what it says on the tin! Suzette and band let rip on a song that Kitty Wells would have been proud to sing and later on ‘Kitty Cat Scratch’ Suzette takes the Kitty Wells formula, drags it kicking and screaming through Buck Owens back catalogue and comes out the other side with a rocking and rolling Country song that would even have me strutting my stuff on the dance-floor. 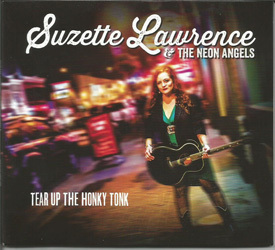 Like all good Country singers Suzette Lawrence takes us through all of the emotions known to man (and woman) with the enchanting ‘Beautiful Dream’ and ‘The Sun Will Rise Again’ but danceable Honky Tonk music is never far away and I defy anyone not to shuffle along to ‘Texas State Line’ or the potent ‘Ye Soy Tejana (I’m a Texas Girl)’ which closes a gem of an album. On the first day I played TEAR UP THE HONKY TONK I was driving around the rolling hills of North Yorkshire in my Volkswagen Estate car; but this album is so damn Countrified I was quickly imagining I was driving through Texas or Colorado in a Ford Maverick with bull horns on the roof and a six pack in the cooler!